Today’s slay-the-books look is all about the rebellious side of INTJ cognition. Other cognition styles are often surprised when the INTJ’s independent streak appears because INTJs are the quiet rebels. Yet, even though they can be rebels, most would never cut class, and they rarely, if ever, break school rules. They’re too connected to future sight. The consequences are just not worth the risk. Besides, INTJs are usually good students. Of course, there are times the INTJ rebel wants to rage against the insanity of the system. They follow the rules, even when they think the rules are stupid. They work hard to fit into a world that thinks one way, while INTJs use many forms of thinking. INTJ thinking is detailed, yet big picture. It is fast and slow. Forward and reverse. INTJ cognition is rebellious, refusing to be just one thing. That’s why our STB Look #3 walks the line between following the rules and rebellion. This look is so on trend that it almost seems to be straight from some rules-bound fashion book. But the INTJ doesn’t want to be like everyone else, not really. 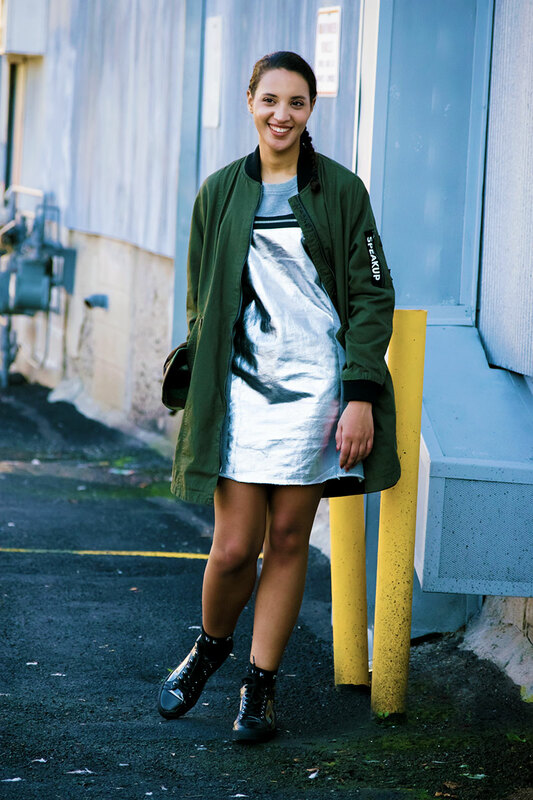 The futuristic silver dress takes this look from basic rule follower to cool rebel. The army green is a good neutral, and the patches are also on trend and can help you express your inner thoughts without saying a word, which appeases your introverted intuition and introverted feeling functions.